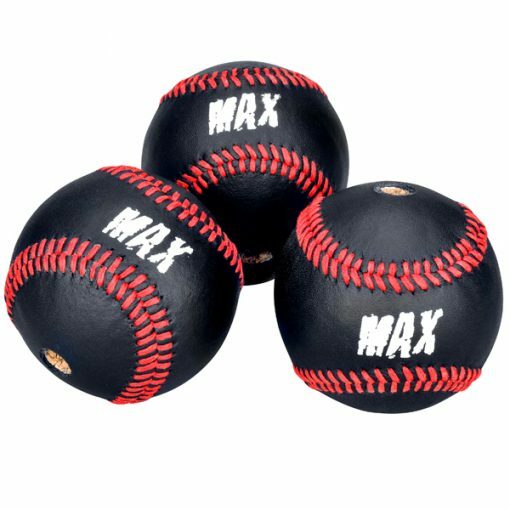 3-pack of Speed Hitter MAX replacement baseballs. The Speed Hitter MAX features a removable Hex Cap that allows you to replace the ball in the event it gets damaged due to rain or the elements, wears out due to use, or just needs to be freshened up. To replace the baseball, you’ll need either a crescent wrench or adjustable pliers to remove the Hex Cap by unscrewing it. Simply remove the Hex Cap and the O-ring, slide the used ball off the end of the shaft, slide the new ball on first and then the O-ring, then replace the Hex Cap by screwing it back into the threaded end. Make sure you tighten the Hex Cap thoroughly by holding the grip with one hand and using the wrench or pliers to tighten the Hex Cap. Hand tightening the Hex Cap will not secure it and it will become loose or fly off when the Speed Hitter MAX is used. After replacing the ball, routinely check the Hex Cap to make sure it is remaining secure. Younger users should enlist the help of a parent or stronger, older person to make sure the Hex Cap is on tightly to prevent it from coming loose with use.